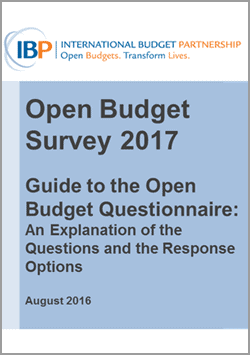 The Open Budget Survey 2017 questionnaire and guidelines are currently being used by researchers to complete the 2017 Open Budget Survey, the results of which will be released in late 2017. Compared to the Open Budget Survey 2015, the 2017 version of the questionnaire includes revisions on sections 1, 4, and 5. Since IBP has not yet decided whether to include all of the indicators in the calculation of the country scores, this questionnaire should only be used as a reference for the collection of information on budget transparency, public participation and role and effectiveness of oversight.